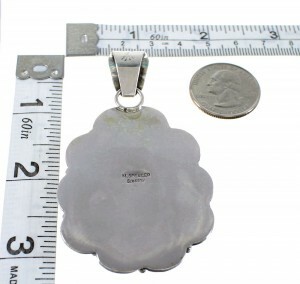 Pendant measures approximately 3-1/8" long (including bail) and 1-3/4" at widest point. Excellent craftsmanship is shown throughout this amazing pendant! 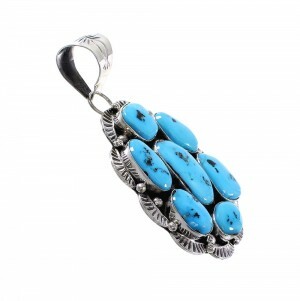 This piece of Native American jewelry is Navajo hand crafted by artist Mary Ann Spencer, out of genuine sterling silver and real Sleeping Beauty Turquoise stones. 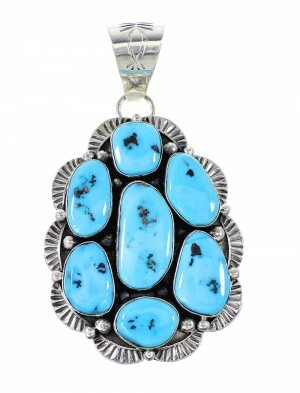 The pendant has a total of SEVEN stones that are carefully placed in a hand cut bezel setting, while silver beads and stamped patterns can be seen accenting for a perfect finish. The pendant is stamped sterling and hallmarked by the artist.